Now that the tails are laid out, it’s time to cut them. Remember to stay inside the lines. Always secure the board with a clamp and a piece of scrap wood. Position your thumb right up against the line. 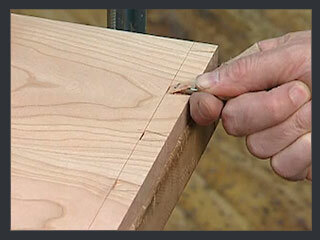 Rest the saw against your thumb to use it as a guide and make a small cut into the line to serve as a guide. 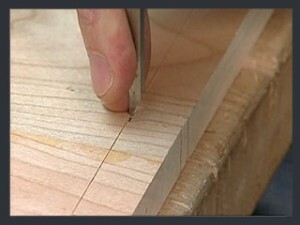 Use the saw to cut along the line. Be sure to stay inside the line. 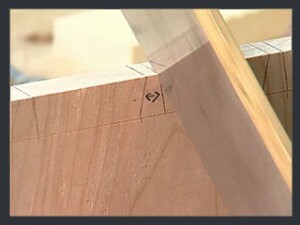 It’s a good idea to cut at an angle so you aren’t cutting the outside face of the board initially. 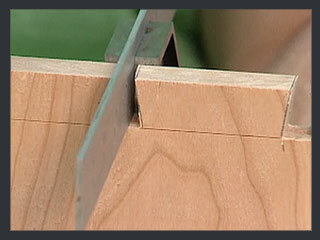 Cut down to the marking gauge line using steady movements with the saw. 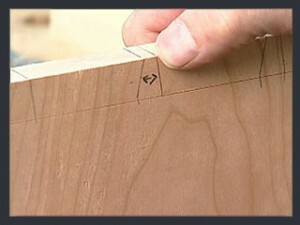 Check the other side of the board periodically to make sure you aren’t cutting through the marking gauge line. Cut along the guide line for each tail along the board. 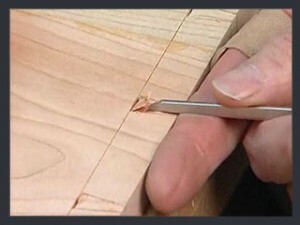 With the flat end of the chisel facing away, position a sharp chisel into the marking gauge line and apply downward pressure to make a small cut or indentation. Don’t use too much pressure. Using a narrower chisel gently remove a small layer of waste up to the indentation at the marking gauge line. Just chip away at the material slightly, holding the chisel down with pressure from your thumb. Follow steps #4 and #5 down the board. 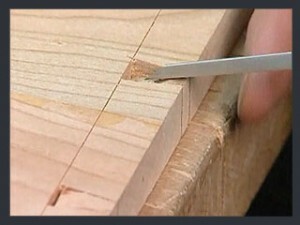 Repeat step #4, except now you will use a mallet to make a deeper chop into the wood. 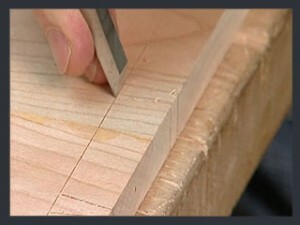 Again, don’t hit too hard, but the cut should be deeper than in step #4. Do this down the board. Repeat step #5, except now you’ll be removing more material. 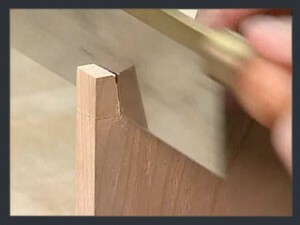 Don’t start your chisel at the edge of the board. 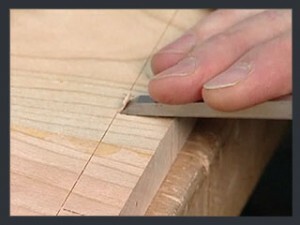 The chisel should start halfway between the edge and the marking gauge line. 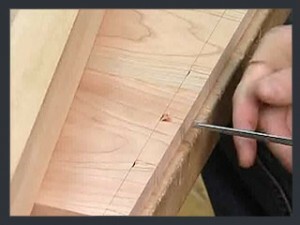 Repeat steps #7 and #8, using even more pressure to make your downward chop into the wood. Refer to the image to see the size of the hole. 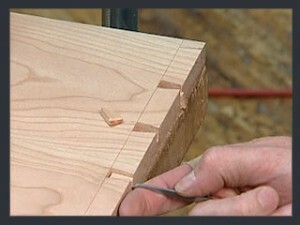 Flip the board to work on the inside face. Secure it with a clamp. Follow step #4 to make a small initial cut in the wood with the chisel, along the marking gauge line. Follow step #5, using a small chisel to take out a tiny chip right up to the marking gauge line. Just as you did on the other side use the mallet now to make a bigger chop in the wood. 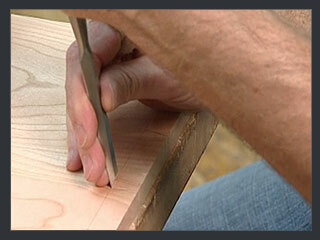 Position the narrow chisel against the board edge. 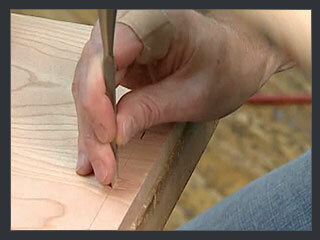 Use a mallet to chop horizontally into the wood, removing material right up to the marking gauge line. Repeat steps #12 and #13, moving down the board and removing the rest of the material. Clean out the hole up to the marking gauge line. 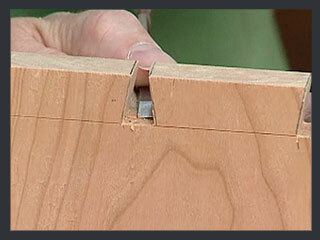 Use the chisel to slice out the wood from the hole, removing excess material around the inside corners. 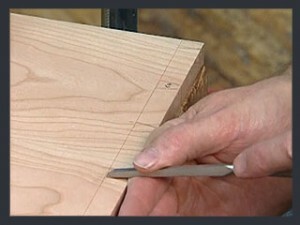 Use a square to ensure there are no bumps. The tails are now cut. It’s time to fit the tails.